Long, sunny days, the smell of barbecue fills the air, and people can be seen walking outdoors. Everyone is smiling as they enjoy the fact that the sun has made a rare appearance, the flowers are out and the birds are chirping. Then there's the Summer weddings, lots of them. People across the land are getting hitched and if you happen to be one of their friends you'll be invited to the 'do'. If you're anything like me you'll instantly begin worrying about what to wear. It's Summer, that means dresses and there's light nights that may get chilly but a coat is out of the question. 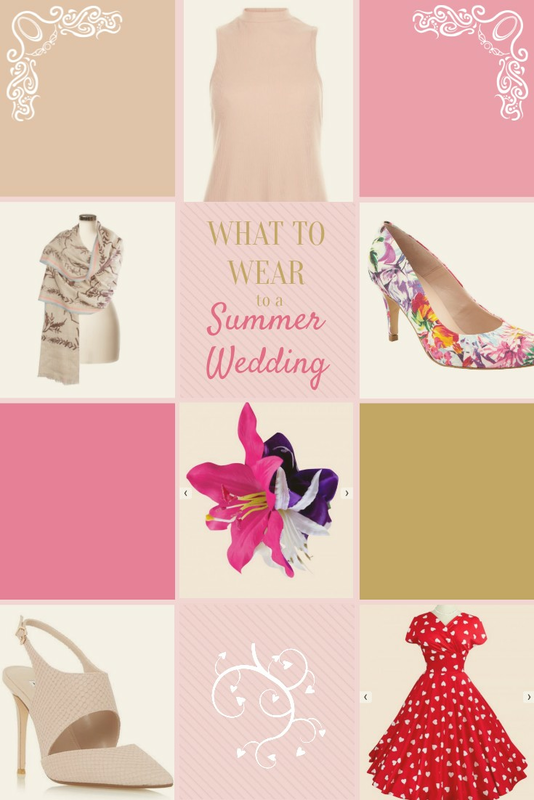 I've always struggled to plan for Summer weddings but this year I've got you sorted. Below you'll find 4 outfits that would be perfect for a Summer wedding. 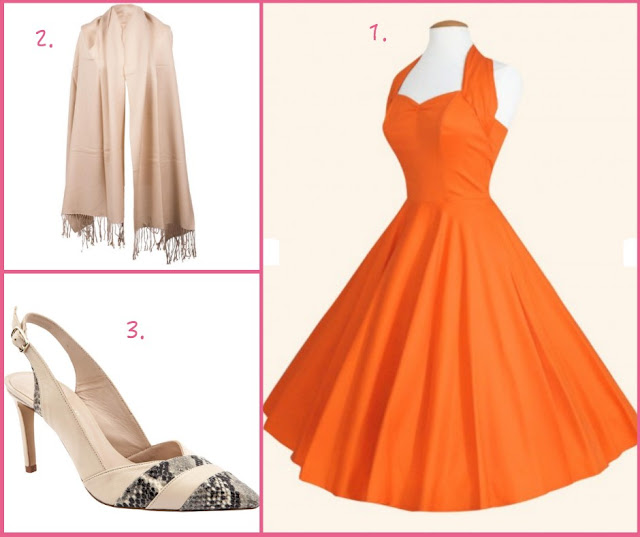 This bright orange dress grabbed my attention straight away, I love it! It's an eye-grabbing colour and perfect for the summer. The halterneck works great on everyone but especially ladies with a bigger bust, and the synched in waist emphasises the slimmer parts of you (creating an hourglass silhouette). Ensure you have a petticoat beneath it and this dress will just the thing to make you feel like a lady. When the sun goes down in the evening and things get a little chilly drape this fabulous pashmina over your shoulders to keep warm. The champagne colour will complement your bright dress, you won't catch a chill, and you add a touch of luxury to your outfit. These shoes compliment the colour of your pashmina so would go great with this outfit. As they're beige you're letting the dress be the centre-piece of the outfit. At 8cm heel height they're not terrible, I think I could cope wearing them all day at a wedding. 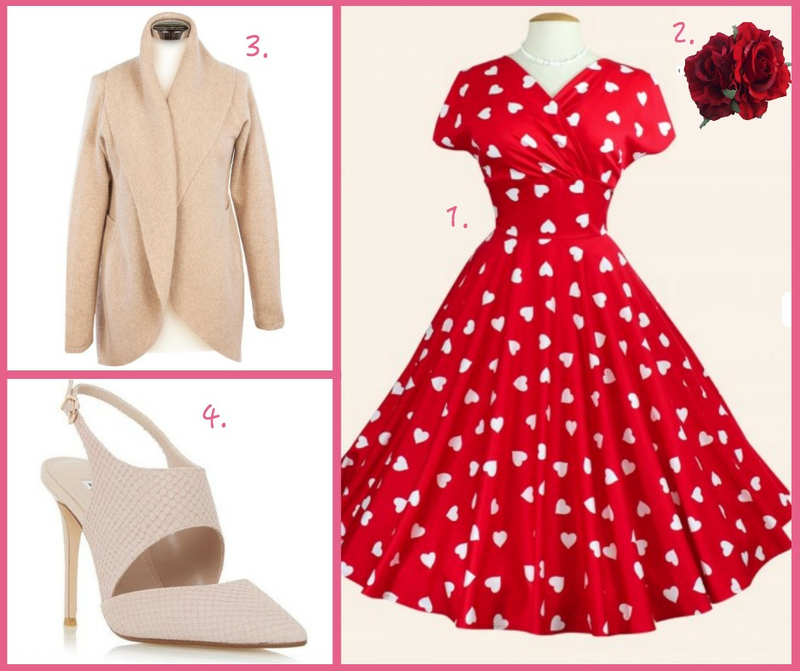 From far away this dress looks like a simple red dress with white polka dots but as you get closer you realise those polka dots are actually love hearts! For a wedding I think this dress is perfect, after all love is all around at a wedding isn't it? This dress would still work really well on a bigger busted lady but has the added benefit of covering your shoulders and upper arms for those who are a little more conscious of those areas. Use this pin-up hair flower for a half-up do. If the wedding flowers happen to be roses then these would work brilliantly, but even if they're not it compliments the sweetheart dress. Add that extra bit of loveliness to your outfit for the cooler evening with this gorgeous cashmere open cardi. The long sleeves will be sure to keep you warm while you're still looking fabulous by not completely covering up your sweetheart dress. With a high stiletto heel (10cm) these court shoes will lift you up and make that dress sway as you walk, making you look even more fabulous! The cut-out and securable strap mean that your feet will feel secure while still having that summery look. Covered in flowers and looking light and airy this dress screams summer to me. It has an embellished neckline and waist so there's no need for a necklace and it looks like it would be easy to wear. Perfect for a summer wedding. 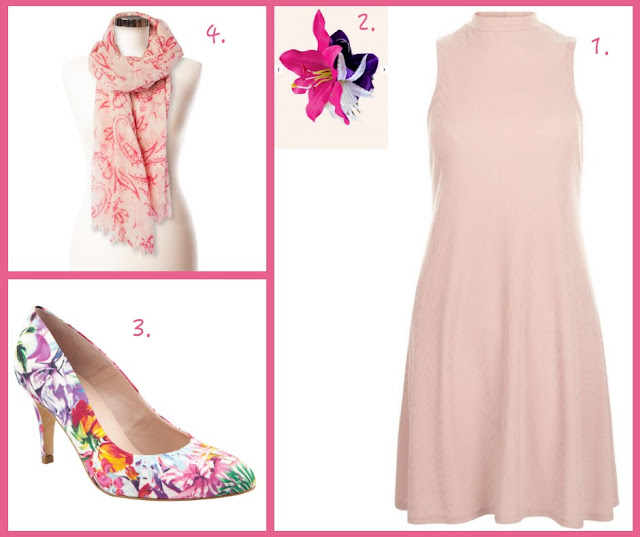 The dusky pink compliments the 'floaty' dress and allows you to tie your hair back without much effort. The bows resemble flowers which again goes with the dress. Comfortable, open sandals with an adjustable strap. There'll be no worrying about achy feet with these and they work with the relaxed feel of the dress. Your dress has no sleeves but when the sun goes down things will get chilly so this flower shawl is perfect. Drape it over your shoulders to keep with the relaxed feel of your outfit. Understated, short, and cheap, this dress is brilliant for the simple reason you can add anything to it and it will still look amazing. A cheap dress is always great because you have more money to spend on accessories! Lilies are my favourite flower and the bright colours in this hair pin are lovely. With such a simple dress the hair pin adds that touch of individualism. I LOVE these shoes! The floral print is so bright and colourful, they're definitely a pair of shoes to grab attention and the heel height is just 7.5cm. The great thing about them being so colourful is you can pair pretty much anything with them and they'll still be stylish. Every outfit benefits from a touch of luxury and this throw is gorgeous. The light pink leaf print goes well with the simple dress and adds to the flowery feel of your outfit. 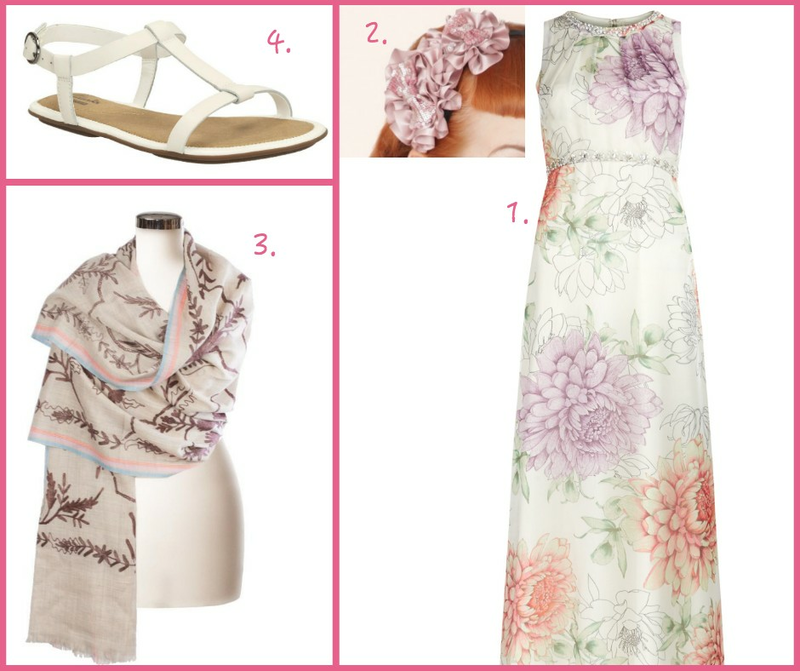 There's an outfit for any budget and I hope I've given you a good idea of the kinds of things you can wear to a Summer wedding. And once you've got yourself sorted you can look at getting your kids' outfits sorted! Which would your favourite outfit be? Oh wow! Great outfits. So summery! Hi Morgan, luckily we don't get invited to many weddings. All of your clothes selections are lovely, but my favourite is the bright and elegant, and as much as I love the brightness of the tangerine, I'd have to go with a different bright colour as orange really isn't my colour. Lovely outfits :) Really summery. We tend not to get invited as guests anymore, they're more professional engagement as the answer to the question, "And how do you know the married couple ..." is usually, 'My husband is doing the ceremony!" Thanks hun. You must get to see so many lovely days! I LOVE weddings. I imagine going to lots of them might get a bit too much though? I love that red dress! Some really pretty clothes here. They're great aren't they? I might just have to buy those shoes in the hope I'll have somewhere to wear them to! fab post and your timing couldn't have been better. i'm off to the Burj Al Arab the end of this month for Afternoon tea for my birthday, dress code is smart/casual which in Dubai translates to OTT and mega glam. The website states women must wear a dress or skirt and blouse, men can wear smart jeans. Very cute style ideas! I just posted some date night inspiration on my blog too! I'd love you to check it out. Thanks Sonia, I'll stop by later.